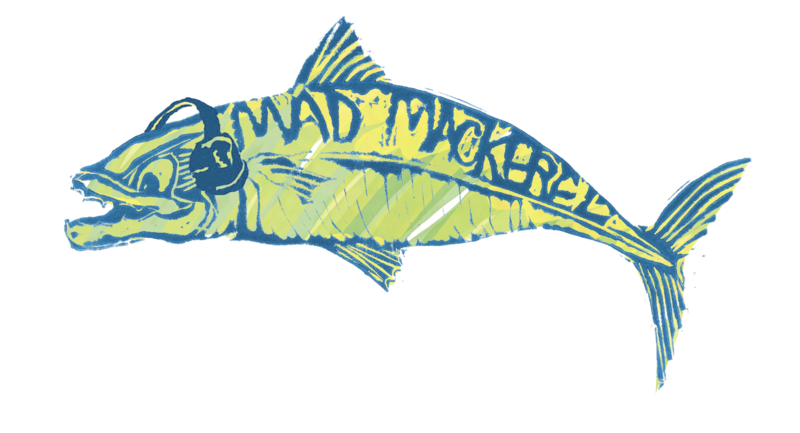 That sounds like the perfect Mad Mackerel house band! A couple of weeks back saw the official release of their second long player, the excellent Same Sad End. A rollicking, unashamedly drunken meander through the flotsam and jetsam of America’s forgotten, tales of murder, deceit, and despair shot through with a boozy camaraderie. Raucous and maudlin, upbeat and down, it has the extraordinary capacity to make you stomp your foot and raise a glass whilst simultaneously weeping into it. Marvellous stuff. We posed our usual set of five to one questions to band members Emchy, Boylamayka Sazerac, and Sizzle La Fey. Boylamayka: 50’s Elvis, Bill Bruford, Django Reinhardt, Amanda Palmer, Bela Fleck. Boylamayka: Got too drunk at that one show and…..
Emchy: I had the perfect counterpoint to Boylamayka’s – mine was that we didn’t buy enough whiskey. Boylamayka: Vintage Bordeaux wine, avocado salsa and midgets. Sizzle: nearest hospital – sickest old person who was still coherent. Cuz they would get it. Emchy: it has to be We All Come to the Same Place – as soon as I wrote down the first words, and then when we were writing it later that afternoon – it felt like it was something more than us. Like hitting some sort of perfect song / perfect moment. And it’s always felt like that. Boylamayka: I agree with Emchy, We All Come to the Same Place. That song became one where the whole is greater than the sum of it’s parts.